In Exodus, the narrator uses only three verses to take the baby Moses from being handed to a Hebrew wet nurse to becoming a young adult. The story moves very quickly. After Moses is saved from the river by Pharoah’s daughter, we fast-forward to him as a young adult just in time for the scene where he kills the Egyptian. 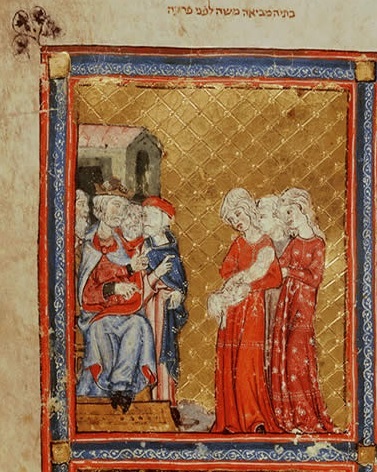 This period of baby Moses’ life is given much more attention in a 14th century version from The Middle English Metrical Paraphrase of the Old Testament than it is in Exodus. and lappyd hym to hym for grett lufe. Hys pertenes he toght forto prove. that barne hed sett he above. Pharaoh’s advisors are appalled by this blatant scene of Jewish insubordination. They warn Pharaoh of the danger of allowing the Hebrew boy to grow to a man and they scoff at Pharaoh’s allowing him to live so close to the royal family. Pharoah hears nothing of their nonsense though – Moses is a clever little boy but he cannot possibly understand the implication of his action in light of current Egyptian-Jewish political tensions much less the prophecy that a Hebrew man will end Pharoah’s rule. It’s just a cute scene and besides – kids do the darndest things! Another advisor – who the text describes as “a wys man of ther law” – chimes in to defend the little child suggesting they conduct an experiment to test his cleverness. Some hot coals are brought in and presented to the little boy and sure enough Moses tries to put them in his mouth. So there you have it, he’s only a cute little boy who doesn’t yet know to be careful around burning objects. Why this scene? Was it for comedic purpose? Was it an original embellishment? Thermuthis therefore perceiving him to be so remarkable a child, adopted him for her son, having no child of her own. And when one time had carried Moses to her father, she showed him to him, and said she thought to make him her successor, if it should please God she should have no legitimate child of her own; and to him, “I have brought up a child who is of a divine form, and of a generous mind; and as I have received him from the bounty of the river, in , I thought proper to adopt him my son, and the heir of thy kingdom.” And she had said this, she put the infant into her father’s hands: so he took him, and hugged him to his breast; and on his daughter’s account, in a pleasant way, put his diadem upon his head; but Moses threw it down to the ground, and, in a puerile mood, he wreathed it round, and trod upon his feet, which seemed to bring along with evil presage concerning the kingdom of Egypt. But when the sacred scribe saw this, (he was the person who foretold that his nativity would the dominion of that kingdom low,) he made a violent attempt to kill him; and crying out in a frightful manner, he said, “This, O king! this child is he of whom God foretold, that if we kill him we shall be in no danger; he himself affords an attestation to the prediction of the same thing, by his trampling upon thy government, and treading upon thy diadem. Take him, therefore, out of the way, and deliver the Egyptians from the fear they are in about him; and deprive the Hebrews of the hope they have of being encouraged by him.” But Thermuthis prevented him, and snatched the child away. And the king was not hasty to slay him, God himself, whose providence protected Moses, inclining the king to spare him. Besides adding the bit about the hot coal test, the scene was not an embellishment at all by the Paraphrase poet. In fact, it’s a surprisingly accurate translation given his version was put into Middle English verse with a slightly comedic mood. Makes me wonder what other texts the Paraphrase poet used to prepare his version of the Old Testament. References to Exodus from the Metrical Paraphrase are taken from The Middle English Metrical Paraphrase of the Old Testament, ed. Michael Livingston (Kalamazoo, 2011). Cardinal André Vingt-Trois has been making headlines during the last few months for sharing his predictable stance on the issue of gay marriage. He has an interesting surname. I was hoping that Vingt-Trois (twenty-three in English) was descended from a long line of Trappist monks, his ancestor named after a famous batch of beer that fetched such a nice price at market that they were able to buy back their monastery from the bank – but it’s actually a little more interesting than that: One of the Cardinal’s ancestors was, as the story goes, left on a doorstep on the 23rd day of the month. Each time some invaders showed up to conquer Egypt, the children of Israel fought against Pharaoh. So, in an attempt to assimilate them, he offered them the hardest and most important jobs in the service of the Sun God: farming and brick and mortar. They helped Egypt exceed its luxurious food security goals and even solved Pharaoh’s treasure storage problems. The children of Israel planned and dug an irrigation system so that when the Nile flooded according to the stars, they made efficient use of its water and grew healthy crops in great abundance. Pharaoh used the ingenuity of the children of Israel to devise ways to haul massive, good quality stones from remote quarries. They built structures so large and sturdy that they can still be seen today from space. In fact, there are still some people around who believe the work was done by aliens! 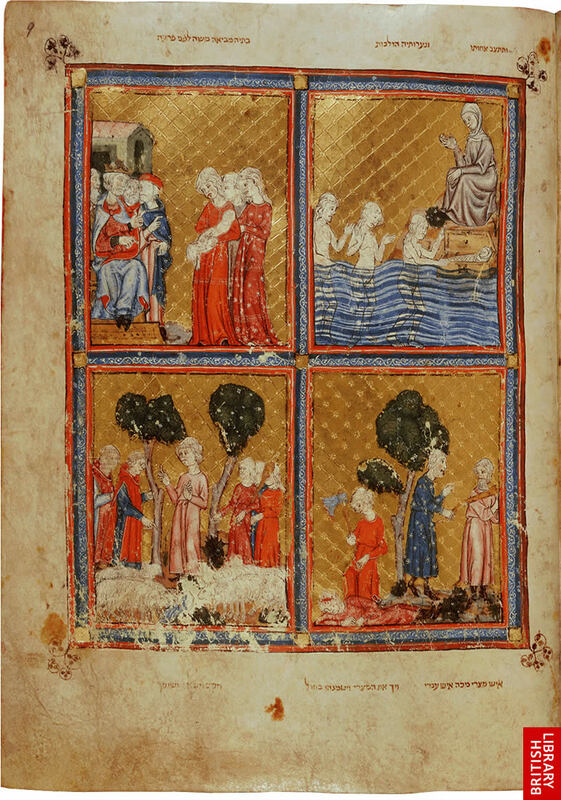 In Marie de France’s Breton lay Le Fraisne (Le Frêne), the heroine received her name in a very similar way as Moses. She was called Fraisne because she was found as a baby in an ash tree outside an abbey. Sche cleped it Frain in that stounde. The messenger and the servants heard what the knight’s wife said and told everyone they knew what happened. The story spread like wildfire through the entire Breton countryside and before a week had even passed, she was the most hated and despised noble in Brittany. qu’elle est de bonne famille. (v.121-134) They wrapped the noble child in a cloth of fine linen and then placed over her the finest piece of striped brocade which her husband brought from Constantinople, where he had been. With a piece of her ribbon, the lady attached to the child’s arm a large ring made from an ounce of pure gold, with a ruby set in it and lettering on the band. Wherever she was found, people would then truly know that she was of noble birth. I love that, a minute ago she was prepared to kill the baby but now she wants whoever finds the baby to know that she comes from a rich and noble family and should be treated with the respect and given the resources rich and noble people are accustomed to receiving. Anyway, the maid rides out into the night, finds a monastery and places the baby in the branches of an ash tree. When the porter wakes up early the next morning, he sees the brocaded fabric dangling from the tree and when he goes to investigate it, he finds the baby. It’s a baby girl. He brings it to his wife and she nurses the baby. When the baby is done nursing, the porter brings her to the Prioress and tells her all about how he came to find the baby. The Prioress decides to adopt the girl as her niece and she names her Le Fraisne (the ash tree). Moses and Fraisne are similar in that their births were kept secret, they were found by someone, nursed, adopted by a strong woman (in Moses’ case, Pharaoh’s daughter and in Fraisne’s case, the Prioress), and named based on how they were found. Moses was in danger of being killed because of Pharaoh’s law and Fraisne was in danger of being killed because her mother was afraid of being humiliated – which is ironic because she’d probably already endured the worst of the public’s ridicule by insulting the knight whose wife had twins. In George Lucas’ Willow, the evil queen Bavmorda imprisons all of the pregnant women in her realm so she can find and kill a baby girl who is prophesied to end her rule. When the newborn is found with the mark (curiously on the arm which is the same place the ring was fastened to Fraisne), a woman escapes with the baby before the evil queen can kill the her. The woman sends the baby down a river in an ark of rushes. The baby is found by an unlikely hero and the evil queen’s dominion falls. Lucas uses the famous ark of rushes from the Moses story for his tale of a female savior. Now, Fraisne didn’t turn out to be a savior or a great prophetess in Marie de France’s lay, but she does get the chance to be reunited with her mother and she marries the best knight in the land. Marie, though, may have been the first poet to give a girl the chance to play the part of the foundling. Metallica, “Creeping Death,” Ride the Lightning (Elektra, 1984). The Oxford Study Bible Revised English Bible with the Apocrypha, Ed. M. Jack Suggs. Katharine Doob Sakenfield, James R. Mueller (New York, 1992), Exodus 2:3-4. References to Marie de France in Modern French translation are taken from Lais de Marie de France, trans. Laurence Harf-Lancner (Paris, 1990). References to Marie de France in Modern English translation are taken from The Lais of Marie de France, trans. Glyn S. Burgess and Keith Busby (London, 1999), p.62.